18 months after the “Not quite the Coledale Horseshoe” incident, I ventured back to the area. This time I was without a large group of friends but had the lovely Tilly for company. The Coledale Horseshoe from Braithwaite is a walk of approximately 11 miles and 1,250 metres of ascent (depending on which fells you include). I was planning on the whole horseshoe but was going to take each mountain at a time and make my decisions as I went along. We set off from the small car-park near Braithwaite at the foot of Grizedale Pike with tantalising patches of blue sky scattered across the horizon but large clumps of cloud threatening to hide the views. It is safe to say that much of the ascent on this route is steep and before long I was taking regular view stops up the grassy slope. The views to Skiddaw, Bassenthwaite and to other parts of the Coledale Horseshoe were lovely and the cloud gave the whole area a mysterious look. At one point as I looked back down the mountain, the cloud filled the valley on my right, threatening to engulf us but it seemed to get “caught” on the ridge and just stayed where it was. The path goes on the edge of the Hospital Plantation, so-called because of the old isolation hospital that has been turned into a hotel. The good thing about a steep ascent is you get rewarded with far-reaching views very quickly. However, as grass turned to rocks and I inched my way up the final scramble, I did comment to Tilly (an excellent listener) that perhaps Grizedale Pike would be enough for one day and we would do the Coledale Horseshoe another time. I also made a mental note that perhaps the “Not quite the Coledale Horseshoe” route had merits after all (given this was where we had missed Grizedale Pike altogether). The moment I stepped onto the summit though all thoughts of giving up there were gone. The views across to Hopegill Head, Whinlatter and the rest of the route ahead were spectacular. Rolling layers of mountains spread out in all directions. After a brief coffee stop next to a random fence post, we headed off to Hopegill Head, which is only a short stroll away but the path gives you a view into the valley towards Hobcarton. The cloud came back again here but only briefly as the sun was starting to melt it away. I was tempted to add Whiteside to the walk at this point as the narrow ridge between the two mountains is one of the best in the Lake District in my view but decided it would be too much for one day. Yes – this was the same person who only 20 minutes before had almost given up before the first summit so the fact I was even considering it was astonishing! We pressed on to Coledale Hause and up the path towards the dip between Grasmoor and Crag Hill. This was decision time. Should I include Grasmoor on the route? The initial ascent looked steep but I hadn’t been on Grasmoor since I climbed the screes from Rannerdale (a long story) and it would give views to Crummock Water and Buttermere so off we headed. The sun cast a warm buttery glow across the fells and Tilly scampered around as happy as anything. It was definitely worth the additional height and distance. We had the summit to ourselves and had lunch looking over Crummock Water. I stared mesmerised at the surrounding fells and Tilly stared mesmerised at my ham sandwich. The next fell was Wandope. I have been on Wandope several times before on different routes and I am always captured by the ridge of Crag Hill from there and the view of Addacombe Hole. The path curves around the ridge from the Crag Hill path to the summit and it is on a slope so it gives a very dramatic feeling to an otherwise quite nondescript fell. Our fourth summit of the day and we were still going strong. The path to Crag Hill was very straightforward and is lined by cairns. The summit is nothing spectacular but what is spectacular is the ridge between Crag Hill and Sail. This narrows in places in an arête with a few scrambles adding a little frisson to the walk. I always keep a close eye on Tilly at these points but she has four-paw drive and I think was a mountain goat in a previous life as she takes it all in her stride and usually just turns around wondering why I am taking so long. A rocky scramble up the opposite slope brought us to the summit of Sail, our final summit of the day. Given the arête and scramble up to it, the summit is surprisingly just a grassy dome, easily missed as you have to divert from the path. What it lacks in interest here though, it makes up for in the views to Skiddaw and Blencathra and Grizedale Pike. Its grassy slopes also make an excellent place to sit down and soak up these views. With the sun still shining, we sat there for ages just gazing ahead. Heading back over the other side of Sail, we then took the path down to Force Crag Mine and the mine road. You can add Outerside and Barrow to the Horseshoe back to Braithwaite but we were both feeling like we had done enough for one day and the walk back was still a good three miles even without additional summits. Tilly enjoyed a splash in the stream as we arrived on the mine road and I am always reminded of a scene from a John Wayne film when I see the mine buildings. They are reminiscent of the Wild West scenes. A gentle stroll along the mine road brought us back to the car-park tired but very happy walkers. An excellent route for a full day walking and it was nice to do the actual Coledale Horseshoe at last! There are lots of places to eat or stay in the Braithwaite and Keswick area - have a look at the Go Lakes website. I am a freelance outdoor and travel writer. I write for Lakeland Walker, The Great Outdoors, Cumbria Tourism, The Lingholm Estate, Home Away UK and various other magazines, websites and organisation. My other obsession is posh heels! 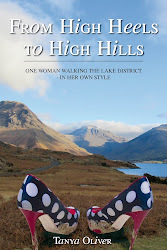 If you like the blog then I have a book "From High Heels to High Hills" available via www.walkingbooks.com that you may also like. I have travelled to many parts of the world but mainly write about the Lake DIstrict and Sussex - two places I am proud to call home. In addition to writing, I manage "Fix the Fells" - a conservation programme in the Lake District to repair and maintain the mountain paths. Enjoy the blog!